Well, it has been quite a week for sports hasn’t it? Undoubtedly, it has been the most eventful week of 2013. All my picks were wrong for the Divisional Round of the NFL Playoffs except for the New England Patriots beating the Houston Texans in a dominant fashion (hooray, I guess). Baltimore got off to a burning start to make sure Ray’s career didn’t stop at Mile High, Atlanta decided it didn’t want to lose by a point on a not-so-last-second touchdown by Russell Wilson, and San Francisco walloped Green Bay on the legs and arm of one Colin Kaepernick. I have switched up my predictions for the Super Bowl (by force rather than foresight) by predicting San Francisco will beat Atlanta 38-24 and that New England beats Baltimore 24-14. I would love to see a Harbaugh Bowl, but I just don’t see New England losing to Baltimore this time around. On Monday, Lance Armstrong admitted to Oprah Winfrey (seriously?) that he used performance enhancing drugs despite all the fuss he created about slander and defamation of character, etc. While the interview has not aired yet, I don’t imagine I’ll watch it. I’ve seen enough of these trials and interviews carry out. Whether it be watching McGwire, Palmiero and company sweat it out on Capitol Hill or Alex Rodriguez promising it was only for a couple years, it’s sad when these athletes come out and admit they succumbed to the pressure of PEDs (although the Capitol Hill Crew didn’t admit to the use of drugs, their horrible cover stories were either later blown open, or were just so awful as to leave no other inference but their use). What is it about Texans and being bad losers about being caught with PEDs? Roger Clemens and Lance Armstrong have to be the worst instances of being outed from the steroid closet. Roger eventually was found not guilty despite the People’s Court begging to disagree, and Lance was in the midst of some sort of trial before eventually coming clean. Why does it take this long? Why not realize that when it comes to a high profile court case, the attorneys assigned to the case will do everything within their power and deep pockets to find the truth. And they will make sure that the world knows the truth, because that is how they get paid. After it is all said and done, you are not only looked down upon for cheating, but then you are doubly looked down upon for lying about cheating. In a world of second chances, you just wasted that second chance on an elaborate lie. Chip Kelly succeeded in making all of us look like fools. He’s going, now he’s staying, and then suddenly he’s gone. These proceedings were so hushed that a star recruit made a comment on Twitter about how Chip was at his house only two days prior to his leave. Truthfully shocking for all of the Oregon Faithful and the sports world as a whole. He had his press conference today, so there will be no more flip-flopping on his position. Despite the “moving van in the middle of the night” departure, I still like Chip. He brought Oregon to a prominence that is rivaled only by Alabama over the last four years and that was unprecedented in Oregon history. Helfrich will step in after a ceremonial head coach search because of an Oregon Rooney Rule, and hopefully all will be right in the world. 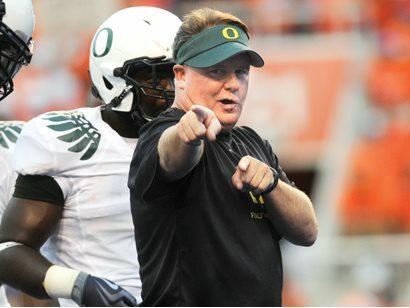 This just in: Nick Aliotti turns down USC job offer which is promising for Oregon’s future. However, reports that the DL coach and three graduate assistants will join Chip in Philadelphia. This news was broken by Jen Beyrle on Twitter. Honestly, I do not know if I have ever..EVER heard a more ridiculous story than the one that is rapidly unfurling in North Bend, Indiana. If you have not read the DeadSpin article, you have to, I implore you. This is stranger than fiction. After reading the article, I have to believe that Te’o was in on it. There is only one piece of evidence that you need to know: he and “she” met each other, albeit for one brief Hollywood moment, after a Stanford game in Palo Alto in 2009. They were able to exchange phone numbers and the romance blossomed from there. Boom. Game, set, match. Checkmate. The pictures have already been proven to be that of another woman. If Te’o has been interacting with the “woman” over Facebook and Twitter for years, he would recognize a discrepancy between the girl he saw outside Stanford’s field and the girl posing on Facebook. Unless there is an M. Night Shyamalan twist in store for us, Te’o was involved in the ruse and we can expect his draft stock to plummet. Not only is the evidence incriminating from the DeadSpin report, the Notre Dame school newspaper has come out and said that people knew that she was not really Te’o’s girlfriend, but decided to play along anyways. Apparently, it was fishy from the start. The week isn’t over, folks! We still have the rest of today, tomorrow, and the next day for something crazy to happen. Will Te’o’s girlfriend appear in phantom form to save the Morman/Catholic’s dignity? Will the NFL announce an expansion division in Europe? Will Ken Griffey, Jr. announce his use of PEDs? (The entire state of Washington just gave a simultaneous shudder.) Stay tuned and find out!